Buenos Aires, Argentina - The last two big concerts of the South American tour by Benjamin Zander and the Boston Philharmonic Youth Orchestra may have featured the same program, but a substantial river flowed between the performances, which were quite different. The estuary of the La Plata divides Buenos Aires in Argentina from Montevideo in Uruguay, but there is no bridge between these two capital cities for the very good reason that the distance across the river is more than 100 miles – it takes a ferry more than three hours to throb and rumble through the crossing. Two cities, two countries, and, in a sense two worlds. 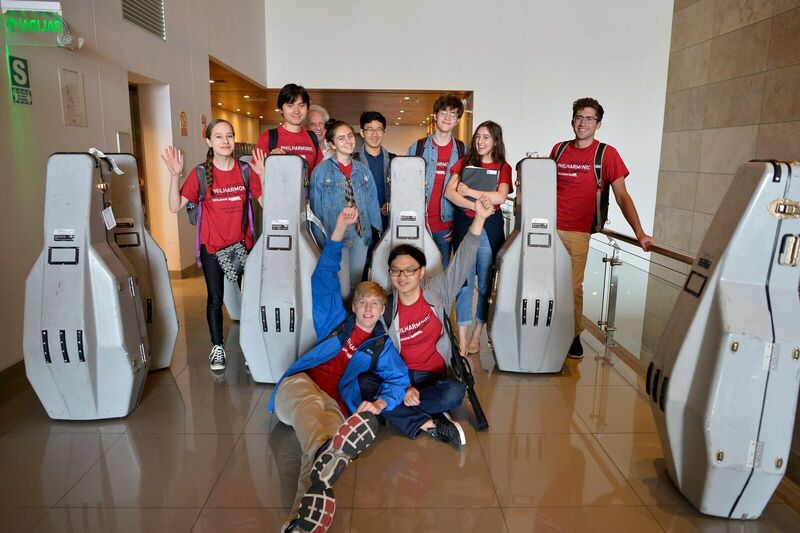 Buenos Aires is a very cosmopolitan place and the BPYO played in its newest and most innovative performance venue CCK, which houses multiple auditoriums, meeting rooms and art galleries. All events are free to the public and seem to be charged with youthful and family energies. Montevideo is less glamorous and less intense in its urban energies; it looks older and feels calmer. The Teatro Solis in Montevideo is the oldest surviving theater in South America. It opened in 1856, built by and for a cultured audience whose descendants still assemble there. 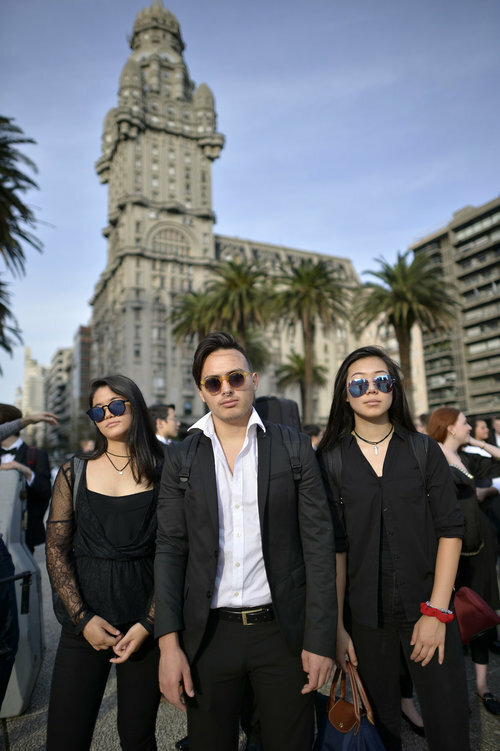 CCK was teeming with young people, but they were a small minority in Montevideo, as they are in most concert and opera audiences in North America. It was nevertheless encouraging to see the three young conductors who had participated with Zander and the BYPO in a master class earlier in the day. On the evidence of just a short time in each city, I think I'd prefer to live in Montevideo, and take the ferry to Buenos Aires for weekend excitement and maybe a great performance at the opera. My guest for the concert in Buenos Aires was a woman of vast musical knowledge and sophistication. The daughter of an Admiral and an Argentine ambassador to Europe, she was educated in England; over the decades she has assembled a collection of historic recordings by orchestras, conductors, pianists and chamber-music ensembles that must be unrivaled. She now serves as an official “queen mother” to other collectors who gather at various Internet sites primarily devoted to performances from the past. I encountered her online a few years ago and I have benefitted from her extraordinary generosity, so it was a treat to meet her in person, although it almost didn’t happen. We had agreed to meet outside CCK before the BPYO rehearsal on the front steps where the busses had unloaded us before. But there were serious traffic issues, so the busses went to another entrance on the side of the building, and when I finally arrived the front, it looked as if I would never find her – the steps and lobby were crowed and the line of people waiting to enter the building stretched as far as the eye could see. I circled around, gave up and returned to the front steps three more times before I decided I should get back upstairs to the main auditorium for the BPYO rehearsal. There I discovered her calmly chatting with Zander and Mark Churchill – she had talked her way in. Clearly she is not a person who takes “no” for an answer. The “blue whale” auditorium boasts bright and pleasing acoustics and might prove a wonderful environment for recording - but outside of normal business hours. The space proved a little less ideal for performance because there is sound leakage into the hall from other events in the building – the salsa festival going on downstairs could be heard between works on the program and even in in quiet passages, and doors opening and closing, and noisy seats, kept punctuating and peppering the sound of music. However the visual impression it leaves is tremendous, and it always exciting to be in the company of a large audience that wants to be present and that responds to everything with vocal enthusiasm. More than once Zander had reminded the players to greet the ovations with smiling and grateful faces. On this occasion this advice was hardly necessary – every face in the blue whale was smiling, or smiling back. This time I won’t “review” the interesting rehearsal and the excellent concert that began shortly thereafter and instead will repeat a couple of things my internet friend said. 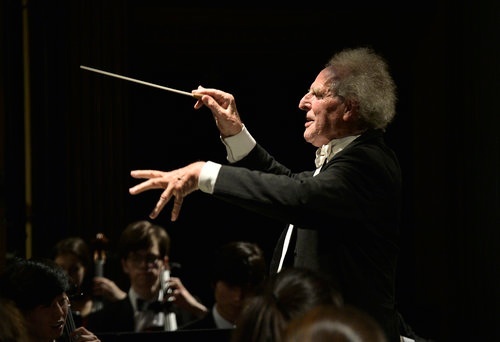 “This youth orchestra is better than our national orchestra,” she exclaimed – and Zander repeated the remark to the players who responded with a round of applause. She was enthralled by the conductor, whose activities and recordings she has followed online with pleasure. What she said to me was that BPYO plays in the manner of the great orchestras of the past, both those she has heard in her matchless sound library and those she had experienced in as a child and a schoolgirl in Europe. In Mo Yang once again excelled in the Sibelius Violin Concerto, although there were a couple of tenderly embracing phrases in the rehearsal of the slow movement that were even more eloquent than they were in the performance - I think I will remember them even when I cannot recall my own name. For the orchestra there were three encores after a stirring performance of Prokofiev's Symphony No. 5, “The Stars and Stripes Forever” and Elgar’s “Nimrod” variation, as well as something unexpected. 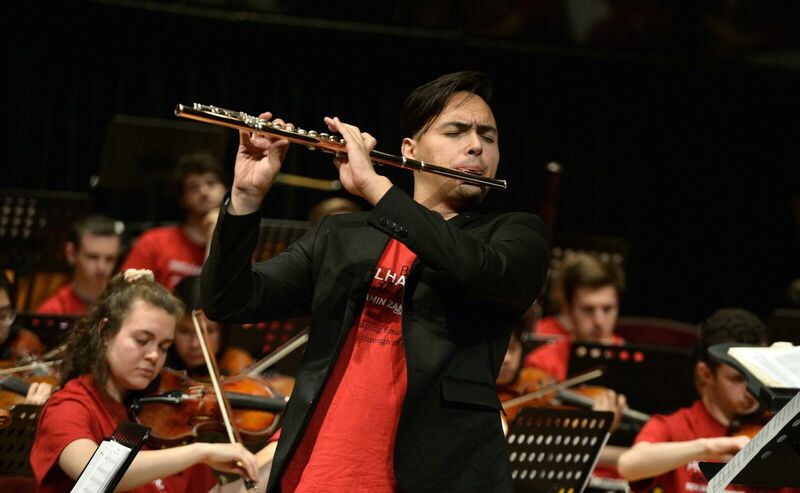 Principal flute Carlos Aguilar had made such an impression playing Piazzolla’s “Oblivion” at the concert for school children the day before that Zander was determined to let this larger audience hear it as well. And Aguilar and the BPYO strings once again wove an evocative incantatory spell. Aguilar’s heritage is Mexican, but he grew up in San Diego. He has a trendy look from the Doc Martins on his feet all the way up to is striking haircut – a design juxtaposing long locks of hair and close-to-the-skull shaving. Over the years he has hung out with experienced and idiomatic tango players so he has learned and mastered the art of improvisation in this style – Piazzolla’s notated score is point of departure for what Aguilar does with dynamics, added pitches over a wider range, timbres and tone colors, bent tones, flutter tonguing and other extended flute techniques. The public went crazy for this – just as the children had the day before. Zander knows how to rouse and audience, but on this occasion he spoke seriously for a moment about an event that took place that morning. The BPYO had made its way to a school in one of the upscale neighborhoods of Buenos Aires – a neighborhood immediately adjacent to a tenement barrio where thousands of people have built their own makeshift homes in an abandoned railroad yard – some of the ramshackle buildings sprung up overnight. Part of this area we were told still lacks water and electricity. People grow their families here in conditions of extreme poverty but some children have been rescued by their schools and by the Argentine El Sistema which with the help of the government which now runs more 60 facilities for teaching music across the city. The BPYO dispersed among several rooms and engaged in multiple musical activities with the children, mostly master classes, lessons, and playing side-by-side. I was not able to go to the school, but Zander was deeply moved by what he saw, heard and experienced. He has repeatedly spoken about it to the orchestra, and after the big concert in the blue whale, he spoke to the audience as well. The BPYO musicians, he said, have been lucky and privileged throughout their lives and the sessions in the morning had helped them to realize exactly how lucky and privileged they have been and with that comes the responsibility to advance social justice. At an opposite extreme from this barrio area and even from the vast and welcoming people’s palace of the CCK, stands the most famous building in Buenos Aires, the Teatro Colon, one of the world’s most renowned opera houses. The ancestor of BPYO, the Youth Philharmonic from New England Conservatory, which Zander led for decades, played in the Teatro Colon during two tours, but the theatre was not available for this time period. The tour leaders had hoped to take the entire group through the Colon, but this proved impossible to arrange. Nevertheless the Colon runs multiple tours a day and several players and tour staff managed to join one of the small groups escorted around the building. The Colon was built to make a statement about the importance of the arts, and it still does; everything from the vaulted ceilings and soaring columns to the mosaic floors says this. There is a grand foyer with busts of composers - Verdi and Wagner, of course, but also Mozart, Beethoven, and Bellini. A century ago Gounod's music was considered more "immortal" than it is now, so he is there too. By today's standards Handel is conspicuously missing, and so are the composers who were just beginning to make their way when the Colon was constructed, figures like Puccini and Janacek. There is still one entrance that can be used only by the holders of the most expensive tickets; there is also a room opulent with gold where the wealthy could “retire” during intermissions – in the old days entrance was denied to anyone who could not speak French, as all the old Argentine aristocrats did. But even in that period tickets for upper ring of the theater and the standing room were much cheaper – indeed they still are – and the gallery was home to excitable debates among opera lovers and dance aficionados, many of them Italian immigrants who had helped to construct the building. The public spaces are vast and imposing, although higher up the materials of construction grow less costly; marble gives way to plaster. In the auditorium this turned out to be a factor in the creation of the Colon’s world-famous acoustics. The interior of the theater is glorious, even in semi-darkness; we were there during a lighting rehearsal for a new production of Swan Lake that was scheduled to open in a couple of days. So the stage, at least was bright. The set for the third act looked modest – a couple of chairs for the King and Queen under a canopy and some painted flats, with a large empty space for the dancers to leap and spin in the air (and for Odile, the Black Swan to execute her 32 dizzying and dazzling fouettés). One exhibit case that displayed costumes once worn at the Colon by legendary singers and dancers of the past filled me with emotion. Leonard Warren sang in the first Metropolitan Opera performance I ever saw, and there was his Rigoletto costume. As I child, I adored Lily Pons, and there was the costume she wore in the wedding scene of Lucia di Lammermoor – I saw her in her in her next-to-last Met performance of Lucia in 1957 with the Met on tour in Cleveland. I was 16 and she was almost 60. I demanded that my parents drive me into town to see it and they were unwilling to face the consequences if they didn't. The second-act dress was gold damask and festooned with pearls – and smaller than some of the dance costumes. Lily was a tiny chic Frenchwoman; she was surrounded and enlarged by the aura of a living legend, which had long, been she was by the time I saw her; she had been singing Lucia at the Met for more than 25 years. I was 16. Now, almost 60 years later, I haven’t yet forgotten the impression she made. Jan Peerce was Edgardo, Lucia's lover. He was his 50s also, and when he rushed onstage in his built-up boots he looked like a harried bank clerk. Then he opened his mouth to sing with that magnificent voice of his, and he instantly transformed himself into a passionate romantic hero. This is a lesson opera has forgotten in our era of television relays. All too often Edgardo is a young man who looks good wearing tights and swirling his cape with flourish, but when he starts to sing he sounds old and rather like a harried bank clerk! Ocampo who died in 1978 at the age of 88 was a writer herself and the friend and supporter of some of the major figures in music, the visual arts, and world literature in her time. She published the magazine SUR ("South") for most of the 50 years it existed; it presented several generations of distinguished South American writers. Numbered among her friends were Picasso, Aldous Huxley, Indira Gandhi, Stravinsky, Manuel de Falla, Virginia Woolf, Albert Camus, Ernst Ansermet and a host of other luminaries many of who sought refuge in her villa during World War II and its aftermath. Her life was energetic and colorful. She was married for only seven years and divorced her husband from within a rigid society where that was almost impossible. Women couldn't drive, but she dashed around Buenos Aires at the wheel of her shiny Packard. The books on her bedside table include a volume by Henry Miller, whose books were banned in North America for decades. Her villa is a handsome structure that looks like one of the summer mansions in Newport, Rhode Island, but unlike them it reflects personal tastes and interests. Her personal library of thousands of books is now designated as a World Heritage collection and contains first editions in many languages, many of them autographed by the authors. I was pleased to see a copy of Rebecca West's The Fountain Overflows, my favorite novel about young musicians and their friend Rose, who wasn't a musician, but represented all the things music is about. For a time Ocampo was involved with the Teatro Colon, which disapproved of her interest in contemporary work. She had even appeared onstage there, according to a framed playbill that stands on her handsome and ornately carved Steinway piano - she performed the role of the speaker in Stravinsky's ballet Perséphone. Zander sat on the lawn for a videotaped interview about education in the arts conducted by our elegant and gracious hostess, the Japanese photographer Masako Kano de Worsnop. She is on he board of the Villa Ocampo and has also been a friend to the El Sistema programs here. Meanwhile the rest of us were guided through the house - we even saw the basement kitchen, now supplanted by modern facilities upstairs; the original looked like the kitchen in Downtown Abbey. In a smaller room adjacent to the music room stood framed manuscripts, autographed photos and drawings, including a sketch of Ansermet by Picasso and some music paper on which Falla had penciled an arrangement for piano of the traditional Russian "Song of the Volga Boatmen." This seemed curiously a propos, because it opens with the same intervals that begin Elgar's "Nimrod" Variation, the BPYO's inevitable encore. Before luncheon there was a brief recital by violinist In Mo Yang accompanied at the piano by BPYO's forceful yet sensitive 19-year-old pianist Richard Rivale who was almost sight-reading music he had only recently been handed, and doing a polished job in a "Cantabile" by Paganini and Fritz Kreisler's delightful "Caprice Viennois." After these and a couple of other bon-bons for solo violin, In Mo Yang offered a surprising encore, the Ballade for solo violin by Eugene Ysaye, one of the most challenging pieces ever written for the instrument, a serious, substantial, profound work dense with ideas and crowded with technical hurdles. In Mo Yang's performance was in every respect a triumph, a display of uttermost technical mastery and musical insight. He managed to make a personal statement out of this sometimes-forbidding monument of music. 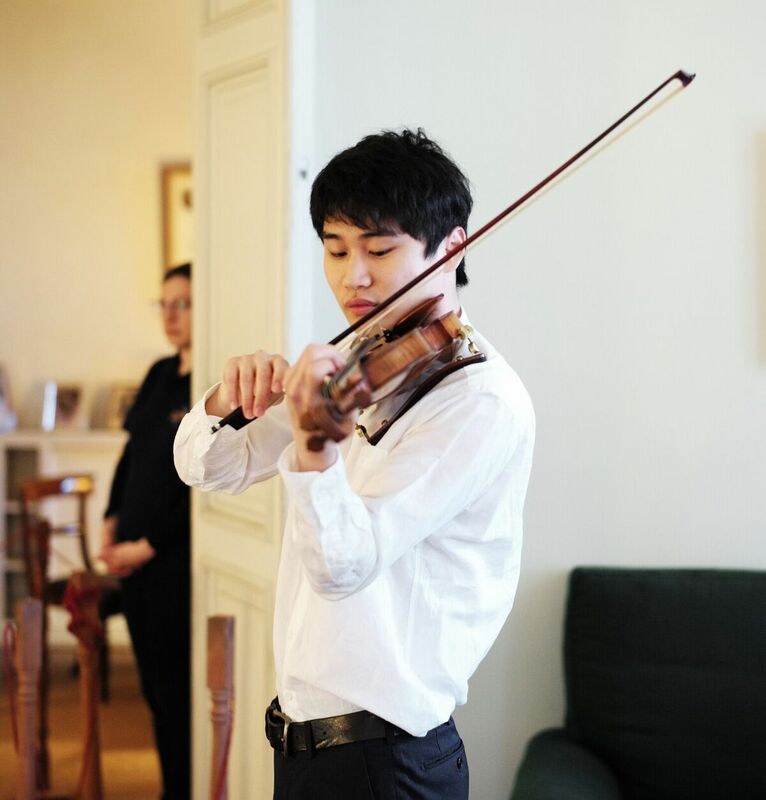 Before In Mo Yang disappears from this chronicle, I should mention his encore in Rosario, Argentina which was probably the most show-off piece this non show-off artist plays, Paganini's caprice on the aria "Nel cor non piu mi sento" from Paisiello's La Molinara. In the opera this was the tune of a slightly naughty duet with a titillating text. Love is the guilty one. You tease me, you bite me. You prick me, you pinch me. What is this thing, alas! The tune is captivating, although young piano students who toil through Beethoven's variations on it seldom get it; other composers have used it too - Villa-Lobos has a guitar piece based on this duet. 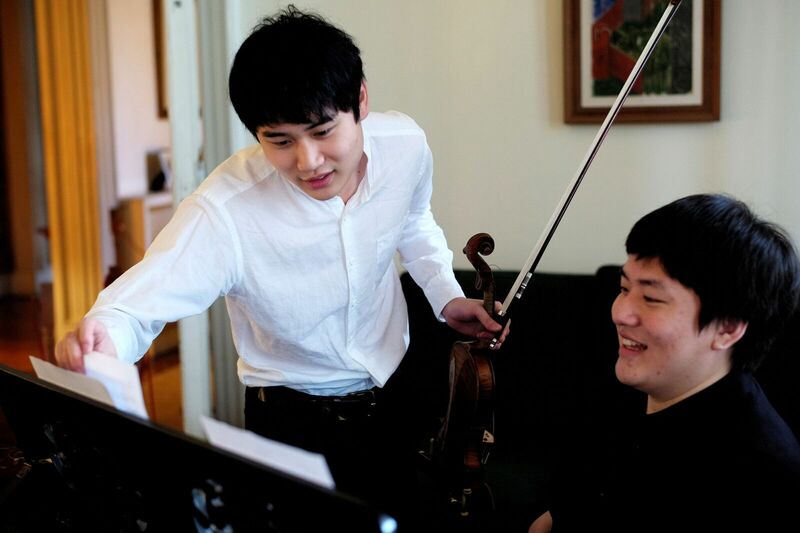 Paganini's response involves a lot of left-hand pizzicato work to characterize the teasing; it requires an insane degree of virtuosity that doesn’t faze Yang in the least. After the staggering performance of the Ysaye Ballade, luncheon was announced. As he ate, Yang said some interesting and amusing things. One of his rewards for winning the Paganini competition was the chance to play Paganini's own violin in a recital. He was allowed only a short rehearsal period, which was attended by the violin's two vigilant guards. The violin itself was full of sonic resources, he said, and very heavy and rich in sound, but it was also difficult to control because it is played so rarely. The concert opened with the entrance of the violin, borne aloft by its guards; only when the violin had reached center stage was Yang permitted to enter. 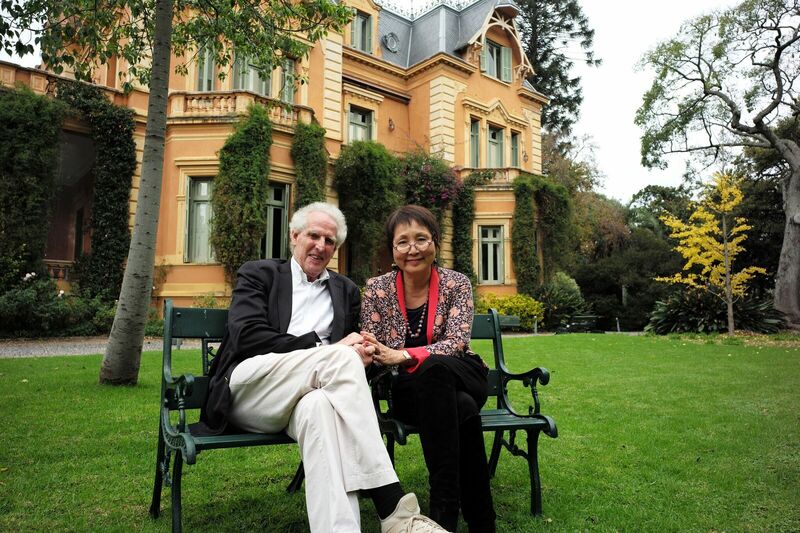 He also spoke of his studies, and of his decision to work with Miriam Fried, who was a member of the jury at a competition, which he failed to win the fist prize. "She heard what I needed to work on and told me directly what my weaknesses were. I liked that," Yang said with quiet modesty. "I knew immediately I wanted to study with her." Too soon it was time to leave this precious glimpse into old Buenos Aires in order to return to the hotel, where we climbed into the busses that would take us to the ferry. At Zander's request we did take the route went next to the tenement barrio - an experience that left many of us with solemn and disturbing thoughts and new or renewed resolves. The ferry ride was fun, sort of. The boat full to capacity and there were trip-long waits in the "gift shop" and at the food windows. The food was expensive and nearly inedible, people said, and I fled the gift shop after a woman carrying a spritzer attacked me with a malodorous perfume that will linger in my clothes until I return to Boston and throw them into the washing machine. Montevideo, Uruguay - Busses met us at the ferry terminal and conveyed us to the Radisson Hotel, a stately structure built in stages over time - there were marble staircases at the entrance and even inside the lobby and the cellos, cello cases and cellists did not enjoy the absence of ramps. The hotel elevators are being renovated, so it took a long time to get everyone upstairs and into the spacious rooms. The dining room is on the 25th floor, and it can be hard to get to - at one point I waited half an hour for an elevator that was not crammed with musicians and cello cases. But the views of the river and shipping docks from the dining room are quite spectacular - "the Top of the Hub," the musicians said. And the buffet was of a different and higher class than anything we had experienced before, and that made everyone happy. The rehearsal and concert took place in the Teatro Solis on the other side of the Plaza Indepencia in front of the hotel. The horseshoe-shaped 1500-seat auditorium with five balconies stacked above the box-seat level must look very much as it did 181 years ago; the original stage house has since been torn down and replaced by a more spacious and modern performance area. By way of comparison, New York's Carnegie Hall opened in 1891 and the old Metropolitan Opera House on 39th Street opened in 1883; Boston's Symphony Hall dates from 1900. Even Vienna's beloved Musikverein was built later, in 1870. For some context: in 1856, the Republican Party in the United States held its first convention as the country hurtled towards Civil War; near Bonn, Germany, the great composer Robert Schumann, 46, died in a madhouse. I really do believe that the walls of a great historic theater contain memories of all the most important artists who performed there and in the first golden age of touring, the Teatro Solis ("Theater of the Sun") hosted many of them. The singers included the most celebrated soprano of the 19th century, Adelina Patti, who sang the most velvety and even trill ever recorded, and the coloratura Luisa Tetrazzini, who inspired a turkey dish. Among tenors there were Enrico Caruso and Francesco Tamagno, for whom Verdi composed the role of Otello. Both of the two most revered actresses of the period appeared here, Sarah Bernhardt and Eleanora Duse. Pavlova and Nijinsky headed the list of dancers, and the soloists included two figures that changed the history of their instruments, the harpsichordist Wanda Landowska and the guitarist Andres Segovia. Zander and the BPYO did not seem intimidated by any of this and played their hearts out in the final formal concert of the tour on Tuesday night, which took place before a house that was completely sold out even before the orchestra left Boston. The acoustics were clear and Zander hopes that the recording will prove worthy to issue on CD. Experienced people in Montevideo remarked on how the audience did not head for the doors the moment the concert was over and remained to listen to and applaud the encores and ultimately to reward them with standing ovations, which are also rare here. I can attest to the truth of this - a woman seated in a box with me got up and put on her coat the moment Prokofiev's Fifth Symphony ended and started to leave; when the encores began she returned remained there, standing, until the encores had concluded. Many in the orchestra were in tears during and after "Nimrod" - for them this was a farewell not just to the audience but to each other as they move on to other cities, other schools, and careers in music, or in classics or business or law or architecture. The Sibelius was again soul-stirring to salute principal violist Dominick Douglas who can hold his own in a duet with In Mo Yang. Previously the four horns had encountered minor problems in their quartet in the concerto, so they had their own private rehearsal supervised by conductor Ben Vickers backstage; Isabel Carton, Joseph, and Cradler, Hannah Culbreth and Maria D'Ambrosio balanced beautifully in the performance. Carton is one of the players I was lucky enough to get to know a little. She has a big job with General Electric, and in addition she's pondering a dual career in music, playing the horn, or singing jazz. She has an unusually deep, warm-toned and resonant speaking voice, so I asked her if she sang; she sent me an MP3 of one of her arrangements, and she's terrific. Aguilar was superb in his control of tonal quality and exact intonation even in the highest register, and Olivia Iverson knows how to tame a piccolo. 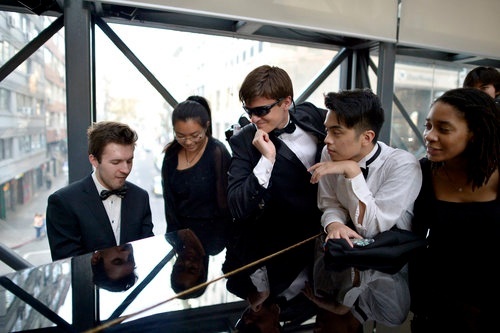 Roee Kawai is an elegant oboist, and the trumpets - Mark Macha, Ben Jones and Arthur Abbate are fearless. Many players come to resemble their instruments - tubist Frank John does not; he's tall and lean, and he is a first rate musician who lays down a resonant and solid bass line to support everyone else, and when the composer gives him the opportunity he can transform the tuba into a poetic and sensitive and evocative instrument. Really. Both of the Yonezaki sisters are wonderful, assured musicians and delightful to talk to. Matthew Ethier's trombone produces a nobly resonant sound; August Ramos leads a very solid bass section and Mark Churchill has forged the cello section into a superbly unified and balanced ensemble. 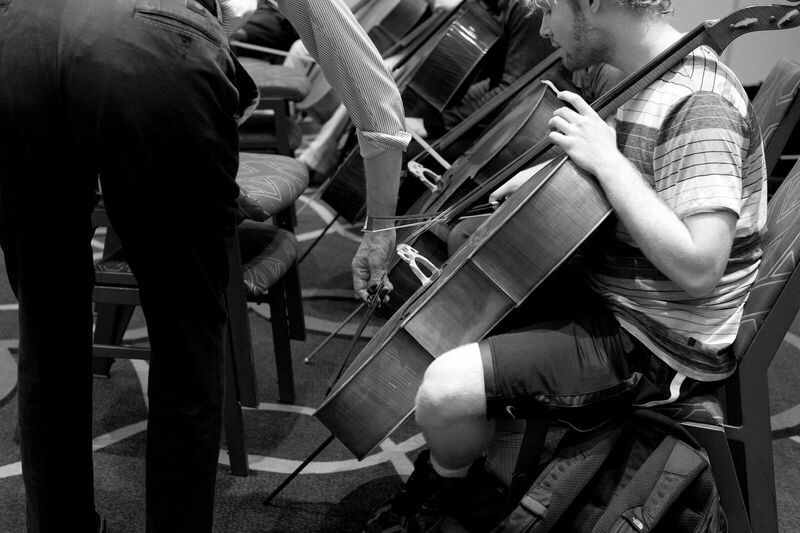 When Zander instructed the cellos to let themselves loose like Rostropovich, they knew exactly what he meant and delivered it to hair-raising effect. Diego Bacigalupe really wailed with the E-flat clarinet, and Jenson Bocco's bassoon is a real character that can project many dynamics, colors and moods. Jason Russo's clarinet is less aggressive than some, but it is supple, warm-toned and full of nuance. The entire percussion section is great fun to watch because the rhythms they are playing engage their whole bodies. The youngest of the percussionists is probably Aidan Carey who can make a bass drum sound mysterious. He's a delightful person who is always hearing music whether or not he is playing. He says he started out as a kid with a drum set ("you know what that means") and now he is hearing his own music and thinking about writing film scores one day, like John Williams. He knows many of the Williams scores by heart and is comprehensively curious about the composer - and just about everyone else in the world of music. Zander also had the orchestra rise, section by section, and the audience played no favorites, cheering them all. Audiences sometimes overlook the second violins. Years of watching Marylou Speaker Churchill at the Boston Symphony and listening for her taught me how unwise and unmusical it is to overlook the second violins. I have never heard BPYO's principal second Greta Myatieva play by herself, except when she is warming up with a phrase or two, but during the tour rehearsals in Boston she became my favorite person to watch - she is 100 per cent invested in every note she plays, and the second the music begins, in rehearsal and in performance, she is completely present within it, and a guide to what to listen to, even when the second violins are resting. I am grateful to all the musicians who went out of their way to talk to me, obeying Zander's request to speak every day with someone they don't know; most of these people, and many others, have been generous in sharing something with me - I should also specifically point out two bass players, Abram Collette and Andre [last name not in the program book] both of whom are off to college In Zander's hands, all of these strong individuals know how to merge into an ensemble, working together with others to create things beyond the powers of any individual. My favorite concert moment came in one city after the close of "Nimrod." Before the applause began someone in the balcony fervently called out "Gracias," "Thank You" and that's how I have felt in this company every day of this tour. 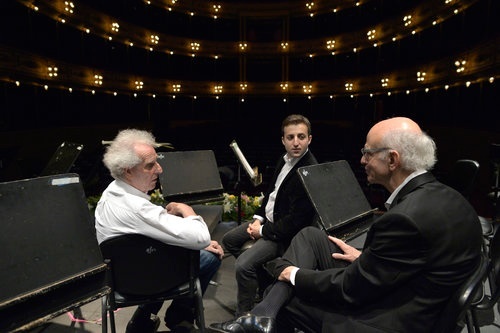 Still to come: Zander's master class for three young conductors; a final side-by-side with the Orquestra Juvenil SODRE, a conversation with an 82-year old Russian concertgoer an amateur violinist, the farewell dinner and acknowledgements in La Casa Violeta restaurant in Montevideo, some odds-and-ends and corrections, and an attempt to sum up a rich and complex experience that defies conclusions because it all about opening up new possibilities.